Medical Solution Company Specializing in Stroke Rehabilitation "NEOFECT"
SEOUL, South Korea, Dec. 28, 2017 /PRNewswire/ — NEOFECT, K-ICT Born2Global Centre‘s member company, develops medical devices and software for stroke patients and people suffering from neurological or musculoskeletal diseases. At CES, the world’s largest electronic device trade show, in 2017, NEOFECT received an Innovation Award for its RAPAEL Smart Glove, a rehabilitation device for the hands, wrists, and lower arms of stroke patients. More recently, the company received its second consecutive Innovation Award at CES 2018 for its RAPAEL Smart Pegboard, a rehabilitation device designed for stroke patients’ hands and arms. NeoFect received its second consecutive Innovation Award at CES 2018 for its RAPAEL Smart Pegboard, a rehabilitation device designed for stroke patientsa�� hands and arms. The main feature of NEOFECT‘s RAPAEL series is its use of games. Unlike other rehabilitation device companies, the majority of which offer products that involve the repetition of simple and boring movements, NEOFECT has introduced a game-based element to its devices to make rehabilitation activities more entertaining and effective. The company’s most recent release is the RAPAEL smart pegboard, which, simply put, is a digital version of the traditional wooden pegboard. 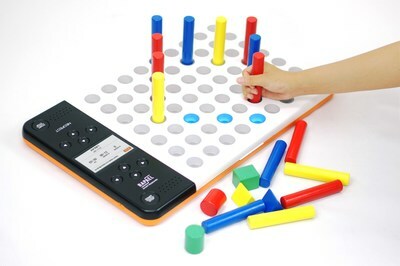 With this device, the patient engages in rehabilitative training by grasping and placing wooden pegs into a board in accordance with the rules of the selected game. The purpose of pegboard training is to enhance hand-eye coordination, fine motor skills, cognitive ability, space perception, and concentration. The 63 high-luminance LEDs installed on the board light up to show the user where to place the pegs. For example, when playing the whack-a-mole game, only the holes where the user is expected to place the peg light up. To have patients make shapes, the lights create the shape of a heart or arrow, among others. The device also provides audio feedback through a speaker embedded in the board that notifies the user of his or her progress through sound effects and voice. CEO Ban Ho-young was always interested in rehabilitative treatment. "My father and uncle both died from stroke. In both cases, it was very difficult to have to just stand by and watch them suffer. During those experiences, I noticed the lack of rehabilitation methods available for patients who have lost most of their motor abilities and began thinking about how to resolve that problem." A university friend of Ban’s who was studying rehabilitative medicine at the time shared his views and suggested starting a company together, thus giving birth to NEOFECT. Ban believes that the greatest strengths of NEOFECT products are practicality and convenience. As an engineering major, Ban was confident about his ability to develop machines and solutions, but knew that he lacked medical expertise. "I visited rehabilitation centers literally hundreds and thousands of times. I met with patients, doctors, and physical therapists to get as accurate a picture as possible of the rehabilitation process." This direct feedback from the field, which we had not considered in his first product designs, was then applied to the creation of NEOFECT‘s final products. Another strength of the company’s products is convenience. Most rehabilitation equipment is very costly (hundreds of millions of Korean won) and quite large, which is why they are available only in hospitals. As a result, patients who are determined to get well have no choice but to undergo rehabilitation at a hospital. Unlike other rehabilitation solution companies, which have focused mainly on hardware development, NEOFECT has grown based on its prioritization of both software and hardware. It is currently developing a rehabilitation solution that involves the use of AI and IoT. Ban said, "Big data is the key. We will be thoroughly analyzing the movements that enable patients to recover their neurological functions more quickly." To develop new products, Ban is also actively striving to attract investment. As of last year, the company’s annual sales stand at around KRW 2.1 billion, but it has already accumulated KRW 13.5 billion in investment, meaning that many companies are very optimistic about NEOFECT‘s potential. The list of NEOFECT investors includes a number of famous KOSDAQ-listed venture capital companies, including DSC Investment and Company K.
After receiving consultations from the Born2Global Centre on patents and two areas of accounting, NEOFECT was able to conduct its business more effectively. The company’s transaction method, which had primarily been B2B, was changed to include more B2C transactions in 2017, allowing NEOFECT to help more patients with their rehabilitation efforts. K-ICT Born2Global Centre (www.born2global.com) is a full-cycle service platform for global expansion. Since inception in 2013, Born2Global has been setting the standard for successful startup ecosystem as the main Korean government agency under the Ministry of Science and ICT. Born2Global has expanded and transformed startups to be engaged, equipped and be connected with the global market.